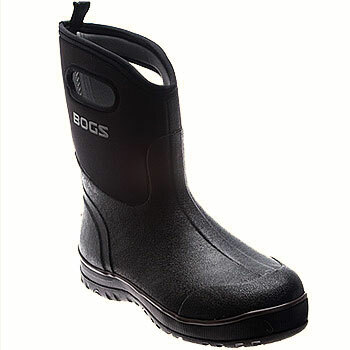 Perfect for slogging around outside, the Bogs Classic Ultra Mid men's shoes are 100% waterproof. The shoes are comfort rated from +60° to -35° and feature non-slip, non-marking outsoles. Four-way stretch uppers allow for a comfy fit, while the Aegis® anti-microbial insoles prevent odor. Second pair of the same boot I've owned- I wore the last par 100+ days each year walking the dog, shoveling, going to and from work. Even as the soles begin to wear, and the uppers developed tiny cracks, the boots remained great for Chicago's winters. After 4 years, the cracks began to let in moisture that would leave my socks damp and the inner sole began to get a little stinky. I resisted as long as I could, but I knew I'd replace them with the same boot. The boots arrived right when they sad they would and the purchasing process was simple enough.